Rice Lake iDimension 100 - The industry's fastest, most competitive dimensioning system. iDimension 100 is the future of dimensioning. Designed as an economical solution for low- and high-volume shipping applications, iDimension 100 dimensions packages, flats and irregular shapes in sub-second speeds. Years ago when we thought about shipping boxes via UPS or FedEx we just placed a box on the counter top electronic scale and we then sent our package off with the carrier. Then we simplified the process by connecting the electronic scale to our desktop computer so the actual package weight displayed inside the shipping software. Well, now we have to update or process again since UPS and other carriers are starting look at both weight and dimensions when it comes to calculating the cost to ship a box. Like its predecessors, iDimension 100 3D Imaging System includes the same DHCP IP address web service and free API for users to interface with the system using a simple HTTP request and XML parsing method. Ideal for industrial and countertop settings, iDimension 100 can be used in retail workstations, offices, shipping and manufacturing environment. Parcels are dimensioned more accurately and faster than manual measurements, eliminating the risk of human error. In an industry leading 0.2 seconds, NTEP Certified dimensions are calculated within 0.2 inches of accuracy. Irregular-shaped packages like cylinders, spheres, tubes, polybags and uneven shapes are dimensioned within an NTEP Certified 0.5 inches of accuracy. Rice Lake’s iDimension™ 100 is the fastest solution for calculating NTEP Certified dimensions of boxes, flats, polybags, tubes and other irregular-shaped packages. 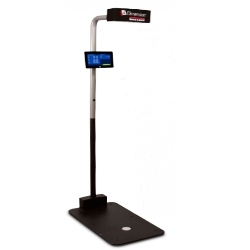 iDimension 100 is designed to ensure freight compliance and deter revenue-loss from miscalculated dimensions in retail, office and shipping environments. With an operator display directly attached and no PC interface required, iDimension 100 is truly plug and play—simply open, assemble and display dimensions.